No matter how much we tell you about what we do, when it comes to kitchens, the "proof is in the pudding"! 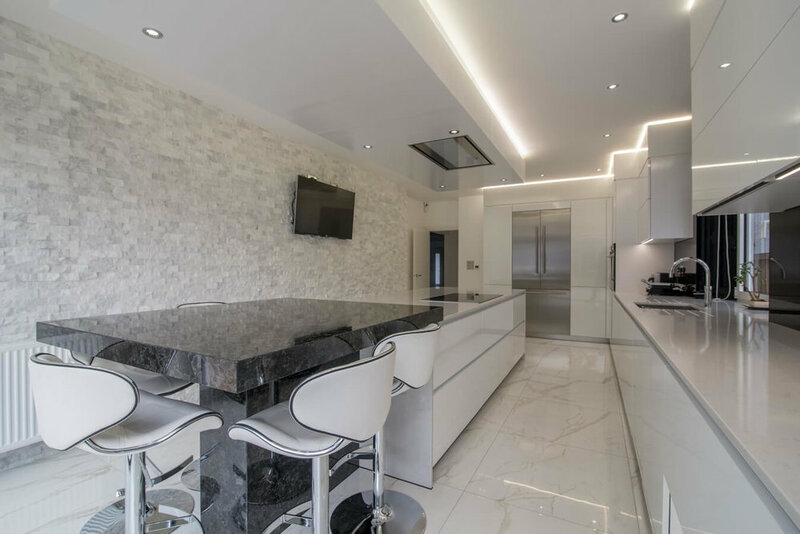 We have worked on some amazing kitchen projects recently and our customers have been happy to let us photograph their kitchen once completed. In many cases we have also created 360 degree views of the kitchens which you can see by clicking the blue 360 icons below. Thank you to everyone who has helped us to compile this portfolio of projects and for allowing us to share your kitchens with others. The links on the right will open up some of the other project portfolios. 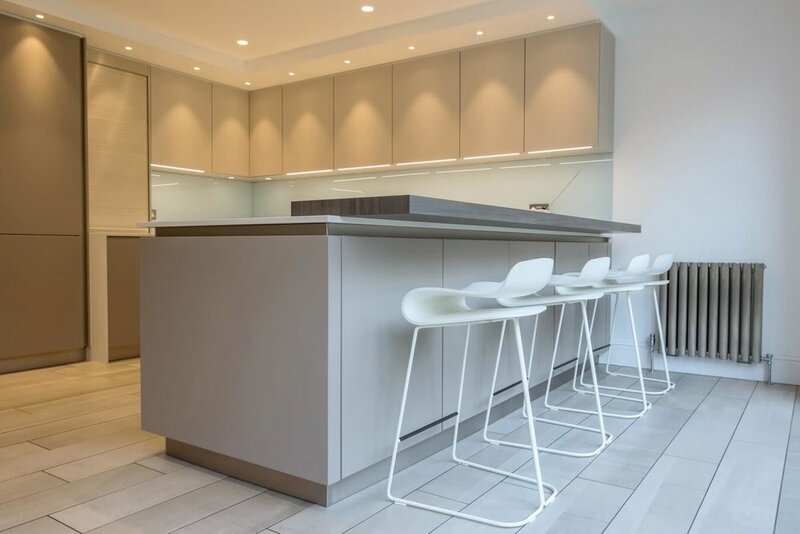 Below you will find a selection of pictures from London based projects using kitchen units from Schuller and Nobilia so you can see some of our work. No library shots from kitchen manufacturers here, just real kitchens that we hope will inspire you and encourage you to have a chat with us. 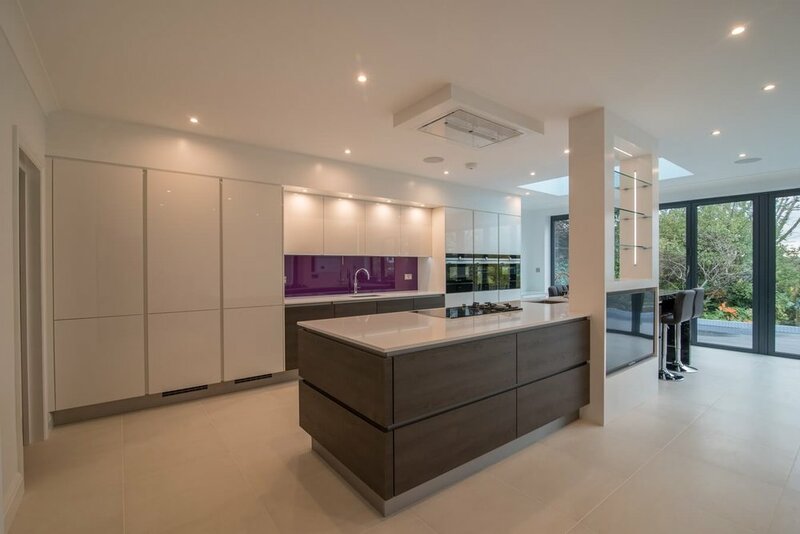 Of course, if you want a new kitchen that is traditional and timeless or perhaps with some bold colour scheme then you just need to let us know as no two projects or clients are ever the same. 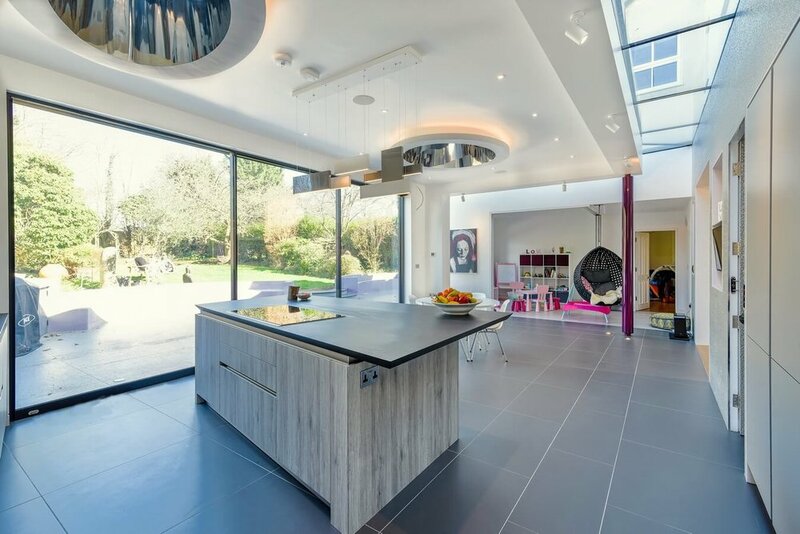 This striking space we had to work with was an extension attached to the main building only with glass. The kitchen is from Schuller and finished in Nova stone grey laminate for the tall units and Wood Cremona Mountain Oak Platinum for the island and base units. 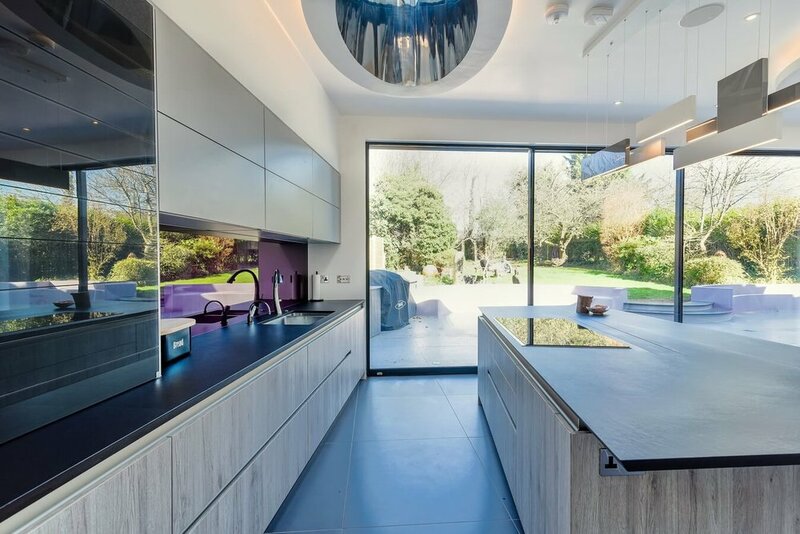 The kitchen island is fronted on one side with mirror to create a floating effect and, its irregular tapered shape required some careful planning and custom end panels. Hidden in the island is a downdraft extractor from Air Uno and other appliances are from Neff and Liebherr. 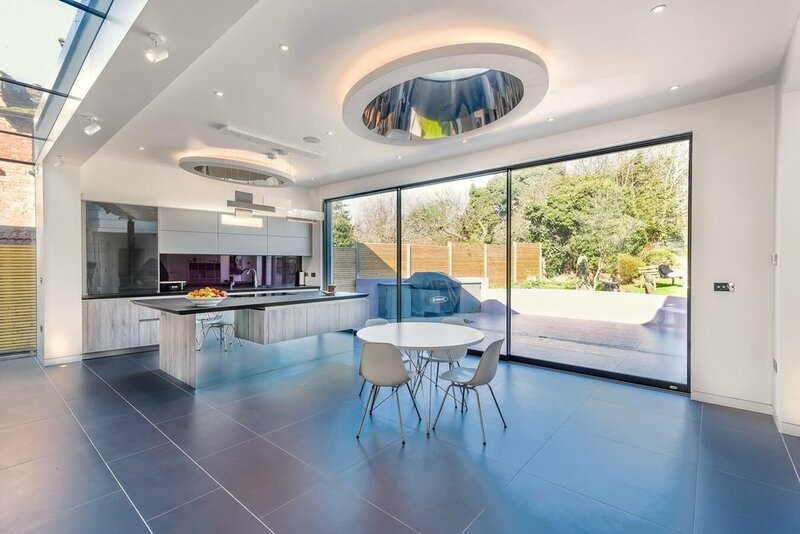 The finishing touch is the striking oval stainless steel skylights inspired by the famous Spanish architect, Antoni Gaudi. 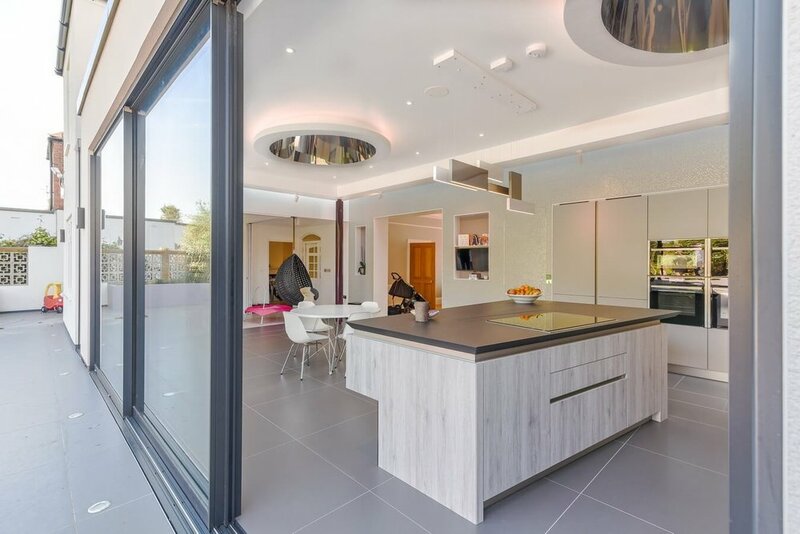 This kitchen, living-room, dining room based kitchen uses lava black and magnolia matt glass kitchen unit doors from Schuller. The worktop is Dekton Irok and the Spekva breakfast bar is real walnut with a matching grain downstand. The high level flush extractor is from Air Uno and benefits from an external motor which increases power and reduces internal noise. A very practical space for family living and entertaining. In this Nobilia kitchen we used a mirror panel around the island to create the illusion of a floating kitchen. 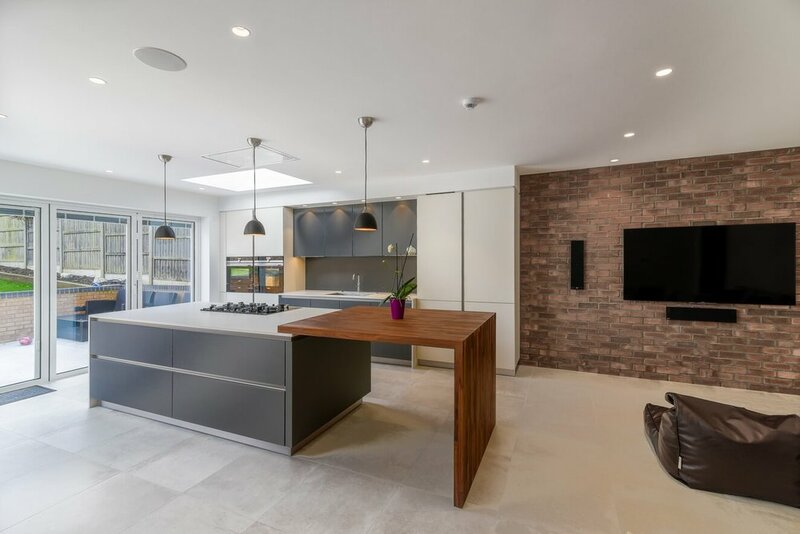 The rustic look of the exposed brickwork combined with the mostly white lacquer finished units which were fitted right upto the ceiling (with some parts in Gladstone Oak) mixes up the very modern with the traditional to create a really multi dimensional look to each space around this room. There is a mix of appliances from Miele, Gaggenau and Liebherr, many of which are hidden away inside units. Fitted kitchen with handleless units from German manufacturer Schuller. There is a mix of truffle brown and sand grey satin lacquer finish colours with a white quartz stone worktop and a pear grey Formica breakfast bar. 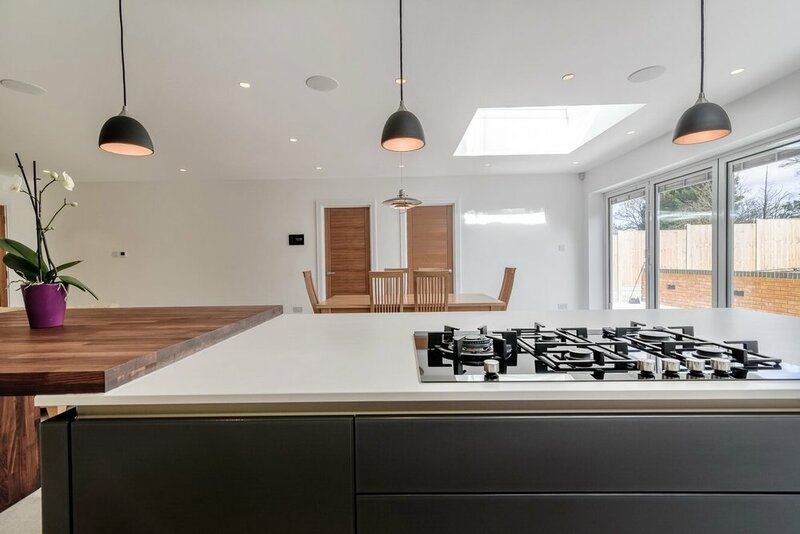 The main worktops are extra deep to allow more space and the kick out effect within the main U shaped worktop area is finished with a custom downstand to match the worktops. The use of miniature LED bulkhead lighting gives a stylish finish to the design. 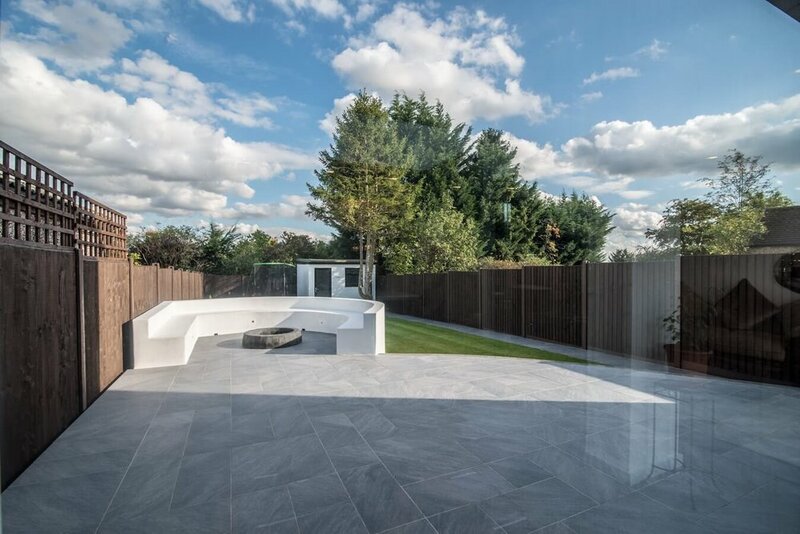 The floor is a grey wood effect porcelain and the glass splashback has a pale blue tint and was made in one single piece on each wall to avoid any joint lines. 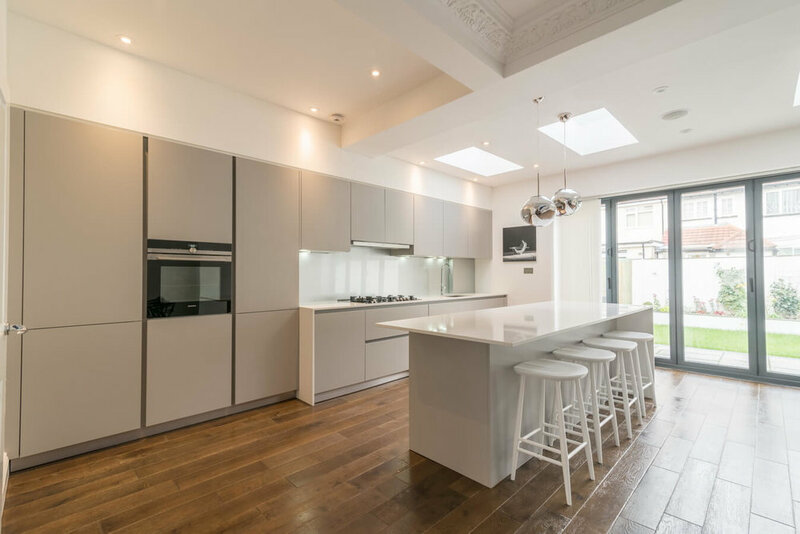 Blending a modern, streamlined, handleless Schuller kitchen into the open plan family space in a traditional home worked wonderfully with this kitchen. 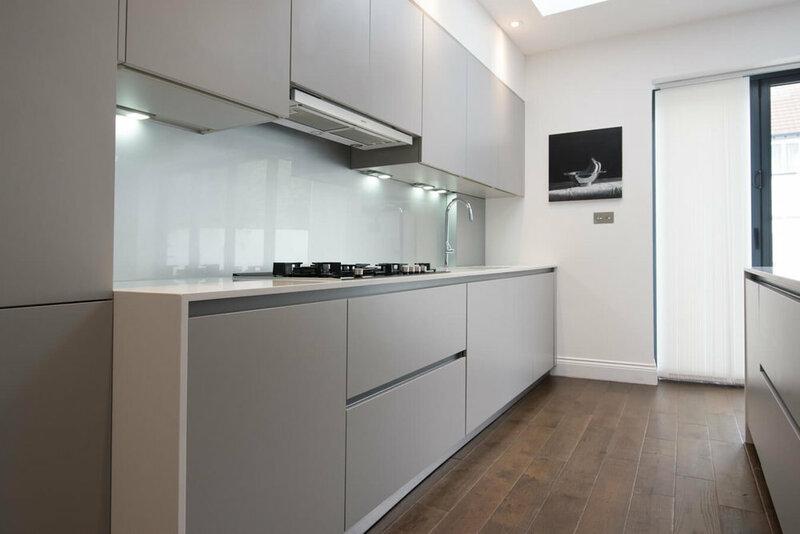 The units are a light grey satin finish with white quartz worktops. 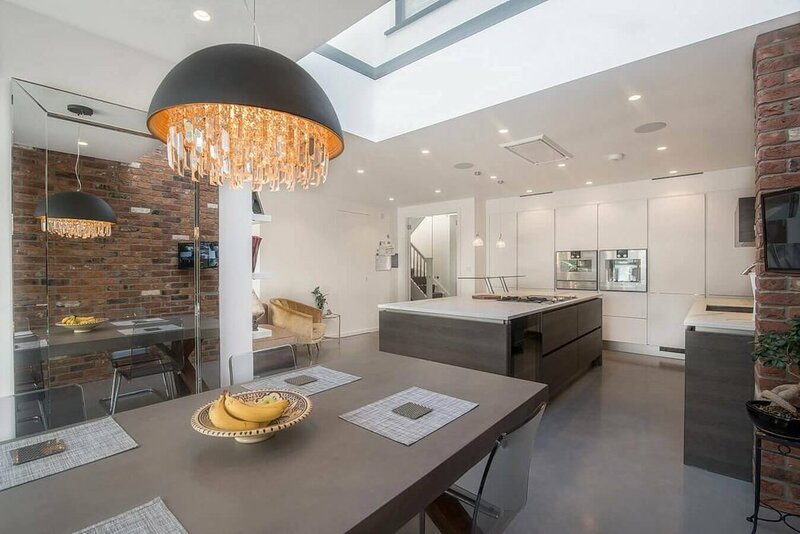 Skylights were used to bring even more light into the kitchen area over the worktops and breakfast bar areas too. Glossy black and white kitchen units from Schuller with the whole kitchen centred around the window and sink gives it a great symmetrical look. 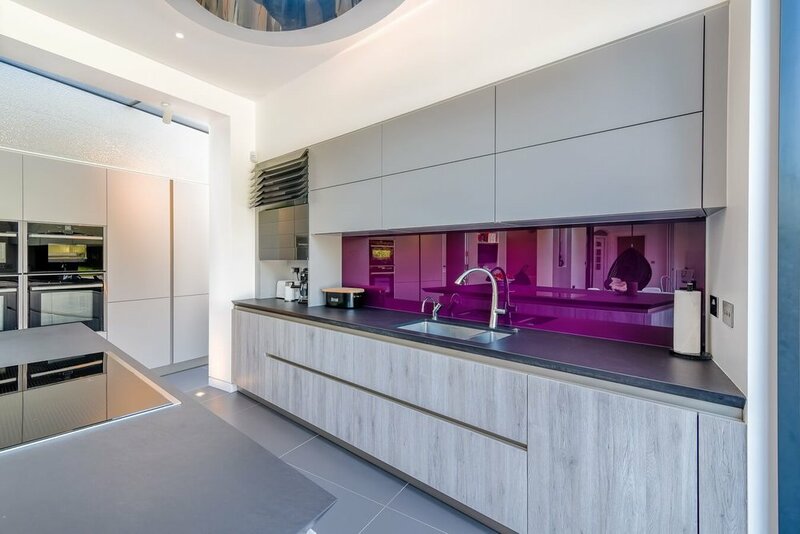 Moiety also designed and installed high level LED feature lighting and a bulkhead for the extractor hood giving a modern feel to this striking kitchen. 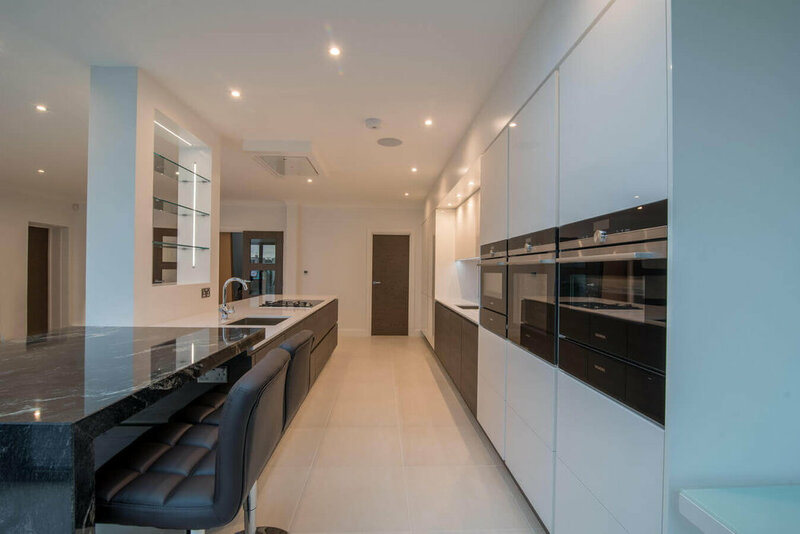 This kitchen was from German supplier Nobilia and included Gladstone oak dark wood and white glossy handleless units. 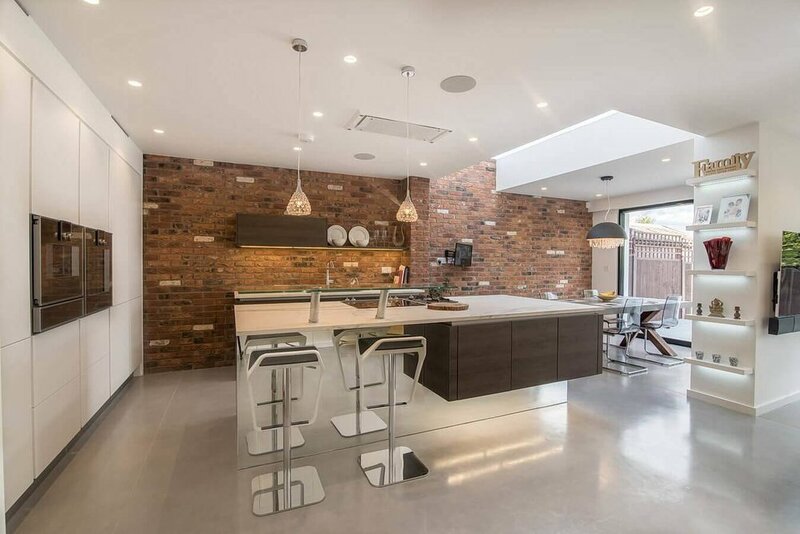 Our kitchen design had to blend in an intrusive structural steel in the middle of the kitchen. This was achieved by creating a shelving & television partition that incorporated the steel pole on one side. The design of this had the added benefit of hiding the sink from the view of the living area .